The three-year European Flexolightingproject – led by Brunel University London and a consortium of partners including Marks & Spencer, Tata Steeland AIXTRON SE– introduced new manufacturing techniques and rethinking of the supply chain, that will reduce the cost of producing thin, high-efficiency OLED lighting panels equivalent to the cost of LEDs. It’s hoped that the new research, which will be made available to European manufacturers, will help herald a new era of low-cost, high-efficiency lighting products. If all of the processes, materials and components developed during the Flexolighting project are adopted, a cost reduction of over 90% is possible, said Professor Poopathy Kathirgamanathan, Chair Professor in Electronic Materials Engineering at Brunel, who has developed a number of common layer compounds, which are now used by Merck. 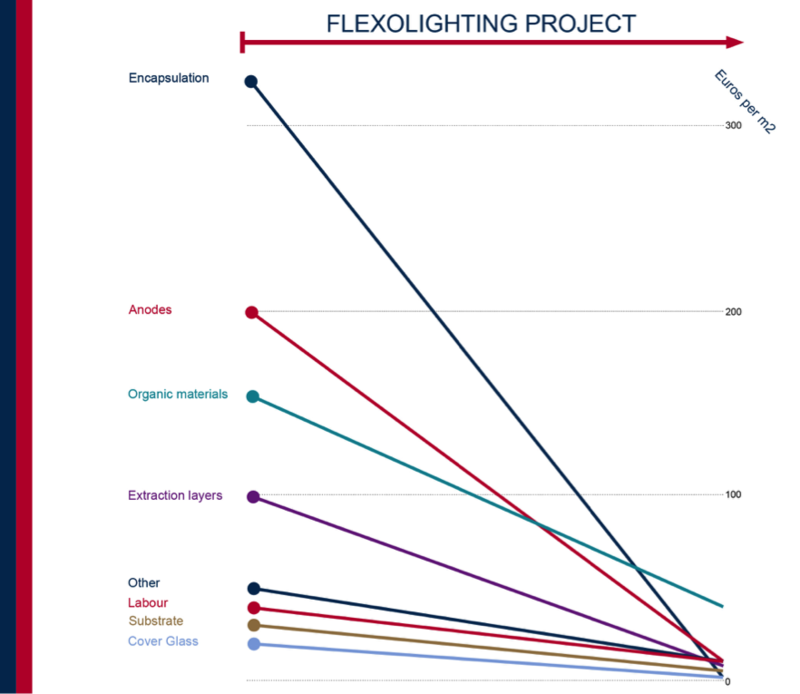 He added, “Flexolighting essentially deconstructed the OLED panel and re-imagined it as a series of individual elements that together can be repackaged to realize cost-effective, environmentally-less harmful, and beautifully designed lighting solutions,” Backed by €4.4m from the European Union’s Horizon 2020 research and innovation program, the group set the ambitious challenge of reducing the cost of producing OLEDs down to around €1 per 100 lumens – from their current position of around €15 per 100 lumens. By introducing a number of innovative new techniques, such as ‘printing’ some of the OLED’s layers onto flexible steel rather than the more traditional glass, and using a newly developed ‘light extraction film’ to double the OLED’s illumination, the group achieved a potential cost of €1.20 per 100 lumens – or a 92% reduction in cost. “We’ve pushed the state-of-the-art to achieve world firsts in processing technologies, used novel materials such as planarized flexible steel and developed transparent top contacts with metallic films,” said Prof Kathirgamanathan. “We also used thin film encapsulation, and showed how effective light extraction can be. The result is a highly innovative concept. By breaking away from existing limitations, we no longer rely on glass substrates and glass encapsulation – we can turn the OLED upside down, maintain conductivity with alternative anodes and cathodes, process the device in a new way and protect it with a thin film. The end product is one that can be formed into an infinite number of design choices, and it was all made possible with European expertise and know-how.” While no products have yet been released using the group’s new techniques, it’s expected that they willfind application in a number of industries, from domestic and commercial lighting, to cars and wearable technology. The report makes many claims, but provides no data to backup the claims. They claim a 2X improvement in light extraction, but so do virtually every other light extraction technique. They claim the replacement of glass with metal foils, but current lighting panel makers have already achieved that in production. There have been many claims that OLED lighting costs can be ci=cut substantially, but the proof is in production and to date we have seen no significant changes.